Swiss Chard is a colorful leafy vegetable that’s as beautiful as it is nutritional. It’s broad leaves are vary from green to red, the stalks can be yellow, orange, red or even white. It’s a popular vegetable in Italy and throughout the Mediterranean. It’s typically cooked but can also be used raw in salads. 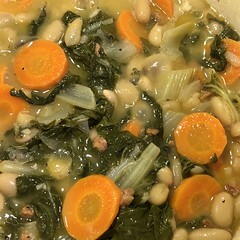 This is a variant on our Swiss Chard and Romano Beans recipe. It can served as a vegetable side or mixed with either rice or pasta. ** ‘nduja is a hot/spicy soft spreadable sausage typical of Calabria, a southern region of Italy, the one we used for this rendition is made locally and is slightly harder than the soft version. Check your local Italian specialty store but look for it in a jar! 1. Heat up 2 tbsp of olive oil in a large pot and fry the pancetta (or ’nduja). 2. Once the pancetta (or ’nduja) renders down add the onions and garlic. 3. When the onions begin to show signs of transparency and the garlic softens add a 1/2 cup of white wine. 4. Once the wine begins to simmer add the 1/2 cup of chicken stock. 5. Once the ‘stock’ returns to a slow boil, add the sliced carrots. 7. As swiss chard softens and starts to wilt, add the lemon juice. 8. Fold in the beans carefully and let cook for a few minutes, season with salt and pepper (to taste). 9. Once the ‘stock’ has reduced to your liking you are good to go!